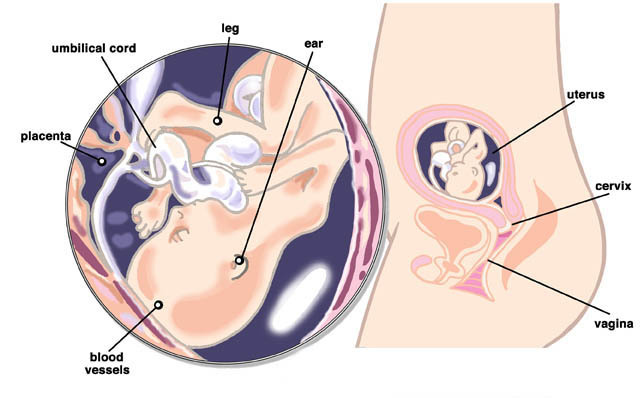 By 18 weeks your baby will be about 14cm in length (crown to rump) and approximately 190g in weight. All the major organs that have formed over the previous weeks are continuing to mature and develop. If you were to see a video of your baby, they would appear to be breathing as at this stage the chest is actually moving up and down in preparation for when it is required to inhale air in the outside world. The baby will probably be experiencing hiccups by now on a regular basis, this is normal, and later in your pregnancy you will start feeling those hiccups yourself! Did you know that the pads on the baby's fingertips and toes are now fully formed? They are even complete with their own unique set of prints. Are you suffering from dizzy spells at all? This is fairly common during pregnancy. Earlier in pregnancy this could be attributed to the fact that your circulatory system expands faster than your body can increase the blood supply. By now, however, it is more likely to be down to the pressure of your uterus against your blood vessels. Make sure that you are no longer sleeping on your back. Back sleeping puts pressure on your major blood vessels (the aorta and vena cava) which will contribute to this dizziness. Back sleeping is also ill-advised for other reasons: it can cause back ache with the increased weight from your pregnancy; it can cause haemorrhoids and it can also affect your digestive system and suppress the circulation to both your heart and your baby. Other factors that can increase dizziness include dehydration, or low blood sugar levels. These are even more reasons for you to ensure that you are eating and drinking properly during your pregnancy. Always make sure that you get up from sitting or lying down slowly to avoid a sudden drop in your blood pressure. As mentioned above, ensure that you are sleeping on your left side from now on as much as possible. This is because it will allow the best possible flow of nutrients to the placenta. It also improves the function of the kidneys which in turn reduces the amount of swelling in the ankles and feet. Don't worry if you wake up and find yourself on your back, this won't cause any harm to either you or your baby, just turn over and try to find a comfortable way of sleeping on your side. Sleeping on your right side is also fine, but do try to favour the left side if you can. This is because the vena cava (the important vein bringing de-oxygenated blood back to the heart) lies slightly to the right of your spine, so left side sleeping puts the least amount of pressure on it. For obvious reasons, sleeping on your front is also out of the question now; your bump will simply get in the way! If you have previously been a tummy sleeper or have always loved lying on your back then this change may be difficult to adjust to initially. Experiment with cushions or pillows, behind your back or tucked under your abdomen to support your bump. There are specially designed pregnancy pillows on the market which many women find invaluable. They can seem expensive but you still have many more months of sleeping with this bump so you may decide that it is worth the investment. Also, it is worth knowing that many women say that these pregnancy pillows double up as a decent support when breast feeding. Page generated in 1.3396 seconds.